In the last decade of the 20th century—as American culture careened between feelings of decline and triumphalism, of one world lost and another yet to be played out—ruins gained a renewed prominence as cultural, aesthetic, and economic objects of interest. Focusing on the seminal work of En Garde Arts, this presentation examines the ruin as both a cultural figure and a material site of urban performance at the end of the millennium. 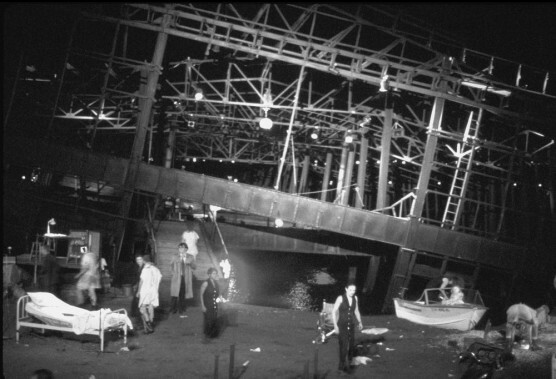 Operating in New York from 1985 to 1999, En Garde sought out locations in which physical, imaginary, and economic space converged to create the theater event, producing works by artists such as Charles Mee, Reza Abdoh, and Mac Wellman in and among the city’s abandoned monuments of the 19th and 20th century. The fictional narratives of collapse and/or reinvention within these works are trailed by historical narratives of the sites they occupy—from the aspirations of initial construction to the forces that occasioned their fall into dereliction—provoking audiences to consider how liminal urban space could and ought to be used in the future. Operating in an increasingly tight real estate market, En Garde’s productions also took part in more material acts of reclamation, displacement, and renewal, claiming “unproductive” places, albeit temporarily, and transforming them into sites of circulation, exchange, and consumption. In these ways, I will argue, En Garde’s theater of ruins participated in debates on how urban space is used, by whom, and for whose benefit, demonstrating ways in which performance can shape the landscape in which it is situated, both in opposition to and support of the status quo. Anne Erbe is a lecturer and creative producer in Yale School of Drama’s playwriting program. She is a former Co-Producing Artistic Director of The Foundry Theatre, where she currently sits on the Board of Directors and the Artist/Activist council. As a production dramaturg, she has worked with Lear deBessonet (Good Person of Szechwan), Aya Ogawa (Ludic Proxy), Charlotte Brathwaite (Sun Ra Visitation Series), and Maureen Towey (Black Mountain Songs), among others. Her essays have appeared in Theater magazine, where she was an Associate Editor.